Images and further details can be found below for the following books: Seven Puzzles of Thought, Fiction and Fictionalism, Paradoxes, Reference Without Referents, Departing from Frege, Logical Forms, Russell, and Thinking About Things, published by OUP in May 2018. Here's an abstract of it. In the blink of an eye, I can redirect my thought from London to Austin, from apples to unicorns, from former President Obama to the mythical flying horse, Pegasus. How is this possible? How can we think about things that do not exist, given that they are not there to be thought about? Thinking about, wanting, hoping and similar states are intentional states: they are directed on things or are about things. Taking as its framework a representational theory of mind, this book explains how intentional mental states are attributed, what their “aboutness” consists in, whether or not they are relational, and whether any of them require there to be nonexistent things. The heart of the book is display theory, a claim about how concepts figure in attributions of intentional states: they are displayed, and the attribution is correct if the concepts displayed match those in the mind of the subject. 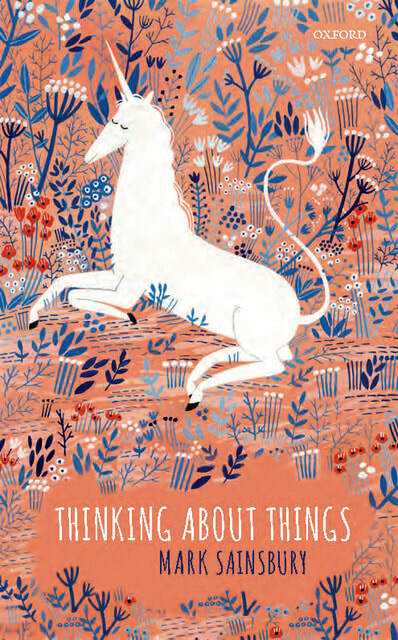 When we say that Ursula is thinking about unicorns, we do not use the concept UNICORNS in the normal way, the way we would use it if we said there were unicorns in the park. Instead, we put the concept UNICORNS on display, and our attribution is correct if Ursula is exercising that concept in her thinking. ​Display theory explains the intensionality of our attributions: some of them seem to involve nonexistent things, and they typically have semantic and logical peculiarities, like the fact that there may be no landscape that a representational landscape painting is a painting of. Display theory predicts that a concept that refers to nothing may be used in a correct attribution of what someone is thinking, explaining how Ursula can think about unicorns; and it allows that an indefinite concept, like A LANDSCAPE, may be displayed in describing what a painting is of, without commitment to there being a corresponding landscape. The nature of concepts is critical to this story. I describe how they can be learned, originated and given a systematic semantic description, independently of whether there exist things to which they refer. There being no things we are thinking about does not mean we are not thinking about things. Seven Puzzles of Thought and How to Solve Them: An Originalist Theory of Concepts. This is joint work with Michael Tye. The main idea is that concepts are to be individuated by their origin, rather than by their semantic or epistemic properties. This provides simple resolutions to a range of philosophical puzzles. The book was the topic of a one-day workshop at the Philosophy Institute in London in March 2012, and there is a podcast of the occasion. There was an author-meets-critics session at the Pacific APA, 3/28 2013. The critics were Paul Boghossian, Agustin Rayo and Mark Richard. 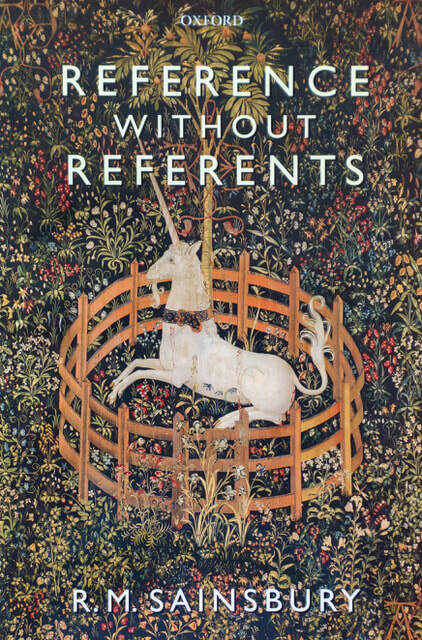 The book argues for an irrealist view of fictional objects (there are no such things, not even nonexistent, merely possible or abstract things). This is helpful for many fictionalist projects, though I argue that at least some of these (modal fictionalism, moral fictionalism) face other difficulties. Third edition, Cambridge: Cambridge University Press, 2009. The main change is the addition of a new chapter, on moral paradoxes. Other paradoxes discussed include Zeno's, sorites, Newcomb's, grue, Russell's, and the Liar. The last chapter discusses dialetheist responses to paradoxes. The thesis is that the right view of typical proper names is neither Millian nor Fregean. Rather, on the right view, names are not descriptive yet may be empty. In that case we have a refererring expression without a referent: RWR. Given the preferred free logical background, this allows for simple and appealing solutions to the main problems in the area. In particular, I hoped when I wrote it that it would end the pointless oscillation between Millian and Fregean views. There is at least one alternative to both. This is a collection of essays, mostly previously published. "Departing from Frege", "Understanding and theories of meaning" (1979), "Evans on reference" (1985), "Concepts without boundaries" (1990), "Russell on names and communication" (1993), "How can some thing say something" (1996), "Easy possibilities" (1997), "Fregean sense" (1997), "Indexicals and reported speech" (1998), "Names, fictional names, and 'really'" (1999), "Knowing meanings and knowing entities" (2001), "Two ways to smoke a cigarette" (2001), "Sense without reference" (2001). Logical Forms is a textbook in philosophical logic (complete with exercises). The focus is on what is involved in rendering natural language into a formal language. The early chapters are practical, inviting the reader to try various ways of formalizing Engish. The final chapter reflects theoretically on the nature of logical form in the tradition from Russell to Davidson. Routledge and Kegain Paul. 1979. This was my first book, and I chose to write it in the hope that I would thereby learn some philosophy.